In 1873 the nation took steps to battle an unexpected problem with the money supply in the United States. Officials initiated the Fourth Coinage Act. Prior to the Fourth Coinage Act, citizens were permitted to bring their silver to the mint and have the metal pressed into coins for use as legal tender. This service, which carried a fee, created problems when the intrinsic value of silver fell below the face value of the coin minted. The difference in these two values presented opportunities for fast, easy wealth to silver holders. This practice created inflation problems, which led officials to revise the laws pertaining to the US Mint. Changing these laws had an enormous impact on the US economy because it ended the monetary standard known as bimetallism. Under bimetallism the value of currency is defined in terms of its equivalent value in one of two metals. Commonly, these two metals are gold and silver. Some were happy to see bimetallism disappear, citing problems with the system, like Gresham’s Law. This principle, in its simplest form, states that “bad money drives out good.” That is, in time, the more valuable of the two metals will eventually disappear from circulation because people will horde the more valuable commodity. However, in the same year of Fourth Coinage Act the United States and Europe suffered from a period of economic depression known as the Panic of 1873. There were numerous causes. Inflation, speculative investments, and massive property losses from the Chicago and Boston fires all contributed. Soon, the nation took steps to resume the free coinage of silver with the Bland-Allison Act. As a result, the Treasury would purchase two to four million dollars worth of silver on a monthly basis for the purpose of minting what became the Morgan Dollar. The decision was the result of a contentious period in US history, but the controversy was just beginning. The original design featured an eagle on one side with eight tail feathers. This detail was a departure from all previous U.S. coins in which the eagle had an uneven number of tail feathers. Eventually, officials decided to change the design back the customary seven feathers. The Philadelphia Mint was the only facility issuing the Morgan Dollar at the time, therefore, they re-cast the dies. As a result, a few rare Morgan Dollars have seven tail feathers superimposed over the original eight. 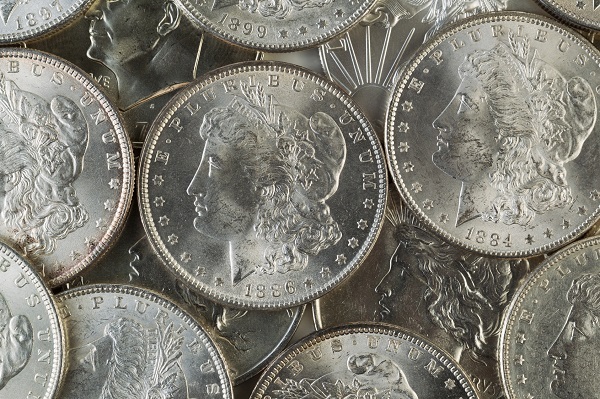 Once the design was corrected, the Mint began issuing the Morgan Dollar in vast quantities. Much of the pressure to mint so many came from silver miners who wanted a stable and predictable demand for their metal. With so many on hand, millions of coins were stored in U.S. vaults. Eventually, the government found a use for the coins when World War I demanded more resources for the war effort. The Mint melted every Morgan Dollar they had - or so they thought. In the early 1960s officials conducted an audit of the Treasury's holdings. To everyone’s surprise, there was a forgotten stockpile of Morgan Dollars sealed, and abandoned in the main building of the Treasury in Washington, D.C. The government decided to sell them to the public. The demand was insatiable. More than 400,00 orders came through with approximately half turned away due to limited availability. Today, the coin remains popular with collectors because it represents such a diversity of story lines, from bimetallism, to tail feathers, to a forgotten cache.